If you own or are thinking about owning an AR-15 rifle, but don’t know about the best ammo to use for range or self-defense use, then you’ve come to the right place. In this article, we will dive into the differences between .223 Remington and 5.56x45mm NATO ammunition, the AR-15 barrel twist rate and how that impacts the choice of ammunition you use. The different types of bullets that you can use for your AR-15, and then some of the highest quality manufacturers of AR-15 ammunition on the market today. First and foremost, you need to understand the difference between 5.56x45mm NATO and .223 Remington ammunition. Many people believe that these two calibers are identical, but this is actually not the case. While the external dimensions of the two calibers are the same, the pressure limits inside the cartridges are not all the same. This is because the .223 round is loaded to a much lower pressure than 5.56. This is why a rifle chambered for the 5.56x45mm NATO round can chamber and shoot a .223 Remington, but the same cannot be said vice versa. For reference, the overwhelming majority of AR-15 rifles and carbines are chambered for the 5.56x45mm NATO round. 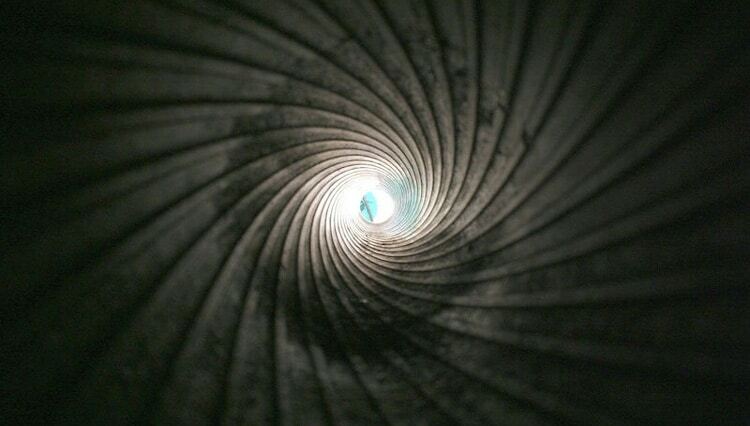 The twist rate of the AR-15 barrel refers to the rate of spin in a rifle barrel, measured in inches. 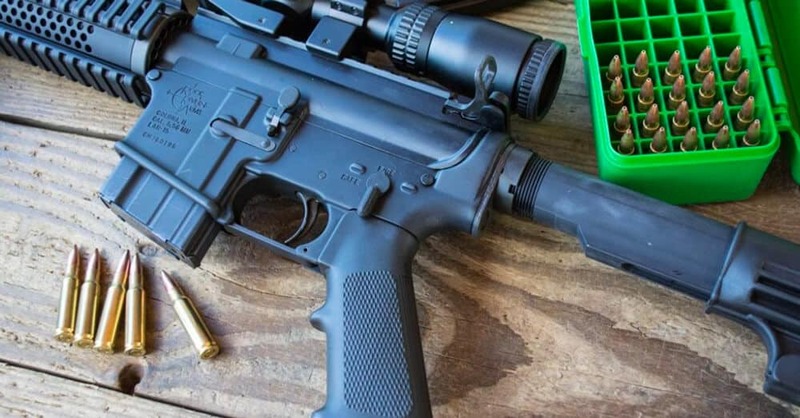 The twist rate of an AR-15 barrel will be anywhere from 1:7 up to 1:12, meaning that the bullet will rotate once every seven to twelve inches when it is fired from the rifle. Knowing the barrel twist rate of your AR-15 is important because it dictates how heavy or light of bullets you can use. 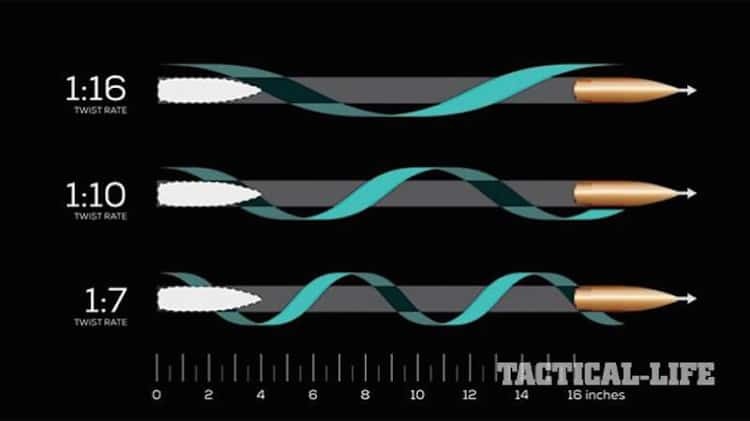 Based on the information in this chart, you can see that the faster your twist rate is, the more effectively it can stabilize a heavier bullet. 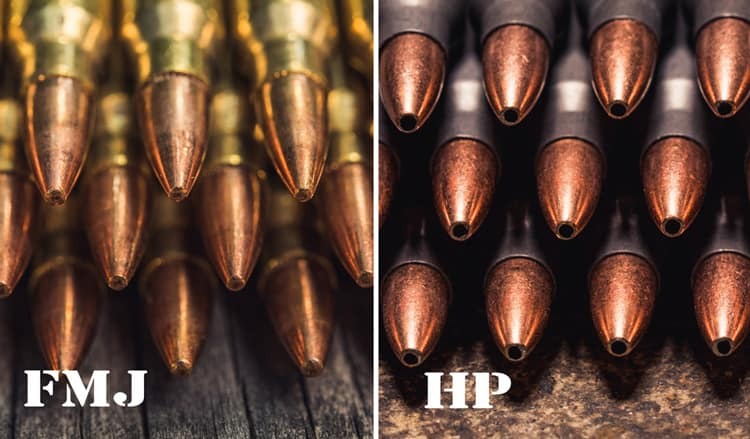 As with centerfire handgun rounds, when choosing ammunition for your AR-15 you have a choice between full metal jacket (FMJ) and Jacketed Hollow Point (JHP), in addition to Soft Point (SP). In general, full metal jacket ammunition is the cheapest and the best choice for plinking, but it also offers the worst expansion and is therefore not the best choice for self-defense. Jacketed hollow point ammunition is designed to expand upon impact and reduce penetration, making it a superior choice for self-defense. Meanwhile, soft point bullets are designed to expand the slowest while penetrating the deepest, which is why they are the most popular choices for deer hunters at longer ranges. In case, you didn’t know, the AR-15 is a very popular rifle in America for hunting deer as well as other similarly sized game, but only with the proper choice of ammunition if you want it to be effective. In summary, full metal jacket is the best choice for target practice, jacketed hollow point is the best choice for self-defense, and soft point is the best choice for hunting. One more choice you will have to make, when choosing an FMJ full metal jacket bullet, is choosing between a bullet hat is boat tailed or non-boat tailed. A boat tailed bullet means that the bullet is fully encased in a hard metal such as copper, giving it a shape very equivalent to a boat when they are viewed from the side. Boat tailed ammunition is widely utilized in AR-15s for competition use because they are very easy to assemble without the possibility of denting or making any other imperfections to the bullet that could hinder its long range shooting performance. In short, boat tailed ammunition is simply more stabile at long distances and has much superior accuracy, and they offer superior ballistic performance as well. That being said, boat tailed ammunition has its disadvantages as well. For instance, boat tailed ammunition will over penetrate, meaning that they will cut through your target and continue traveling. In a self-defense or hunting scenario, this can result in collateral damage and perhaps even injury to innocent bystanders. In contrast to this, non-boat tailed ammunition will offer slightly less performance and ballistics and accuracy when it comes to long range shooting, but they will also penetrate less as well. But that being said, remember that full metal jacket ammunition in general will penetrate much more than jacked hollow point ammunition. For self-defense purposes, you’ll want to stick with jacketed hollow point rounds that will expand upon impact. The X-Tac 55 Grain M193 ammunition from PMC is quickly gaining ground in the American ammunition world. This is brass cased, non corrosive, and boxer primed ammunition that is also reloadable. PMC also produces this ammunition at a price point so that it is affordable for the average shooter. If you want the same X-Tac ammunition from PMC as listed above, only at a heaver bullet weight, then you’ll want to give close consideration to the 62 grain variant of this ammunition. This ammo is loaded to NATO specs with excellent penetration, but you must be careful to load it only in a rifle chambered for 5.56x45mm NATO and not .223 Remington. American Eagle is an established name in the ammunition world, and the 55 grain XM193 5.56 ammunition is a superb choice for your AR-15 rifle. These rounds have been tested to function properly in temperatures ranging from one hundred and twenty five degrees Fahrenheit down to negative forty degrees, and each bullet also features a boat tailed design for excellent accuracy and ballistics performance at longer ranges. Another economically priced option from PMC is the PMC 55 FMJ boat tail ammunition. This ammo is a great choice to go with for target shooting. Each round is boat tailed and boxer primed for superior long range performance, and is also reloadable. The Wold Gold Line of ammunition utilizes brass cases in contrast to the less reliable steel case, in addition to boxer primers. These rounds are manufactured in Taiwan and also utilizes a non-corrosive propellant with a full metal jacket bullet, and is also non-magnetic, which is unique. Speer Gold Dot is well known for being some of the nicest and best performance self-defense rounds on the marketplace, and these .223 Remington rounds are certainly no exception. Each round is chemically bonded to ensure that it is has proper weight retention, and they also utilize a non-corrosive nickel plated brass. The .223 Remington ammo from Federal LE Tactical is designed specifically for law enforcement use in urbanized areas, and will therefore b a great choice for self-defense. Each round is equipped with a boat tail hollow point projectile that is designed to shoot straight and deliver a muzzle velocity of over three thousand feet per second. Black Hills has been producing ammunition since 1981 and they have gained a high reputation for quality. They are also notable for being the ammunition of choice for the military’s long range shooting competitions, which says a lot about the quality and value that they provide. These specific rounds are loaded in brass cases and are boxer primed. First and foremost, if you are looking for 5.56 ammunition that is California compliant, then the 55 Grain GMX Hornady Superperformance ammunition will be exactly what you are looking for. These rounds utilize the proven polymer tip design that will help them deliver more energy upon impact, while the copper construction helps ensure proper expansion as well. Based on the information you have learned in this article, you now know the difference between 5.56x45mm NATO and .223 Remington ammunition as well as the different factors to take into consideration when choosing a round for range use or defense and some of the best specific types of ammunition to use for your AR-15. Boat tail actually refers to the shape of the bullets base and has nothing to do with its jacket. 5.56 bullet weights I think peak out around 80 grains all but one or two of these reviews tops out at 55 grains. A .22 LR weighs 40 grains. Could you give us some kinetic energy differences here please. I hate a devil’s advocate but I’m looking for knock down power fellas. Thank you. Excellent article. Glad I read it and I did save it to my favorites. Thanks.